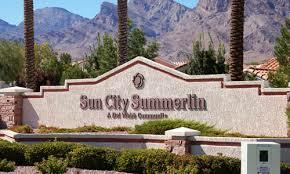 Homes for Sale in Summerlin. Summerlin, a development of The Howard Hughes Corporation is literally master-planned to perfection and will be for years to come. Since 1990 this community has grown to encompass more than 150 parks, more than two dozen public and private schools, 14 houses of worship, nine gold courses, three resort hotels, world-class recreational facilities, retail, and entertainment centers, well-established office parks, a state-of-the-art medical center and more — all playfully connected by more than 150 miles of nationally-recognized, award winning trails that span the community. A wealth of high desert activities, including hiking and rock climbing, encourage a healthy outdoor lifestyle. In Summerlin, the abundance of amenities combine to create the community’s hallmark quality of life. To view homes in this beautiful community contact Tracy Drown at 702-245-9341. EXTRAVAGANT LUXURY x201D; - 6 BR/8 BATH EXQUISITELY FURNISHED TRADITIONAL HOME ON TPC GOLF COURSE. FAMILIES AND ENTERTAINERS WILL DELIGHT IN THIS DRAMATIC OPEN FLRPLAN FEATURING WET BAR/POOL TABLE/LIVING AND DINING ROOM ENOUGH TO SATISFY THE MOST DISCRIMINATE TASTE. LUXURIOUS MASTER SUITE * HIS/HER x2019;S POWER OFFICES, THEATER ROOM, WINE ROOM * RESORT LIKE POOL * SMART HOUSE * GUARD GATED * CUSTOM FURNISHINGS, ART, STATUES, LINENS ETC, INCLUDED. Located in the coveted Bellacere community,this stunning home has all the amenities of a personal oasis.2 casitas to be utilized as office or exercise rms,2 master suites,dwnstrs&up,basement w/game,media&wine rms.Gorgeous travertine flooring inside&out.Outside offers equally desirable amenities,including 2 BBQ x2019;s,fire pit+fire wall.Front of home features a beautiful waterfall w/fountains in back along w/salt water pool complete w/exercise jets. Fall in Love with this Tuscan style custom home on an oversized corner lot. Located in the Guard Gated Mountain Trails community in the heart of Summerlin. It features a Designer Kitchen, a 5 car garage, stunning pool and spa, large spacious bedrooms, hobby/craft/workshop room, Brazilian cherry Hardwood floors, attic with shelving & pull down stairs and a finished basement that's over 2,000 sq. ft.! Dining & Shopping minutes away! Magnificent home with exceptional views on the golf course in Canyon Fairways. Excellent floor plan with large, bright rooms, vaulted ceilings, a huge kitchen that is brimming with top-of-the-line Wolf and Sub-Zero appliances, granite counters and marble floors. 2 master suites, both with huge closets and baths. The home as 2 apartment style guest houses that have bedrooms and living rooms, there x2019;s a separate office too. Pool and spa are amazing.